Blog > Quizzes > Take This Quiz & Find Out Which Hiberknitting Animal You Are! Nothing remedies the winter chill better than a cozy night. But which hiberknitting creature are you? Take our fun personality quick to find out whether you are a cozy bear, or perhaps a doting dormouse? Maybe you’re a funky skunk or a fancy ladybird? There’s only one way to find out! Answer these 10 questions to discover which hiberknitting animal you are! What’s your perfect winter knitting project? 1. A winter blanket to curl up with. 2. Some bright stripy socks in my fav colors. 3. A bobble hat and scarf to keep me toasty. 4. A spring cardigan – I better start now! 5. Some fabulous cushions and furnishings for my home. 6. A gorgeous chunky sweater. Which cozy yarn would you rather snuggle up with? What’s your hiberknitting beverage of choice? 1. Hot chocolate with extra marshmallows. 4. Cool drink for me! 5. Hot honey, lemon with fresh ginger. Where do you like to hiberknit? 1. Snuggled up in bed. 2. On the sofa in front of the television. 3. With my friends – hiberknitting is more fun together! 4. Out and about – the cold doesn’t bother me! 5. In my favorite cafe. 6. At my desk – I’ve created a hiberknitting spot at work. All hiberknitters need a break from their needlework! What do you like to do between rows? 4. Hop along to a winter work out! 6. Forage the fridge for some tasty snacks! What’s your ultimate hiberknit stitch? Snow day, where will we find you? 2. Playing with the kids in the snow – I’m a big kid at heart! 3. Curled up indoors by the fire. 5. Wandering the marvellous winter wonderland. 6. Snowday? I’m napping here. What colors and shades will you be curling up with? 1. Rich earthy natural tones. 2. Black and white for maximum impact! 3. Gentle creams and greys for a comfy muted palette. 4. Greens and blues work best for me. 5. Bold classic red is my signature shade. 1. Finish all those WIPS! 2. Start a brand new project for a new season. 3. Perfect my knitting stitches. 4. Get a head start on my projects for the rest of the year. 5. Learn a brand new knitting stitch – that will impress my fellow knitters! 6. 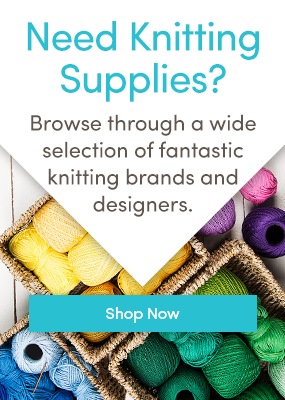 Stock up on supplies and yarn! 3. Dried fruits and nuts. 4. Something adventurous, that I’ve never had before! Why not share your hiberknitting animal on social media? It’s so simple! All you need to do is save your adorable winter spirit animal by right clicking on the image above. If you’re sharing on Instagram don’t forget to use the hashtag #hiberknitting and tag us @loveknittingcom. You love nothing better than curling up in the cold months to finish those unfinished knitting projects and making sure that uneaten holiday chocolate doesn’t go to waste! You feel most at home with gorgeous natural woodland tones and thick cozy yarns. You like to make a statement! From top to toe, you are one of a kind with your bold designs and striking colorways. It might be winter but your creativity and flair for interesting design is already putting spring in your step! Demure and understated perfectly describes your knitting style. With soft yarns galore this Winter, your projects are always the epitome of cozy chic. You love to knit with friends around you, where you can pick up a new stitch technique (or two)! Always one leap ahead of the knitting pack, hiberknitting gives you a chance to hop ahead with that brand new knitting project! Bright blues and green tones reflect your love of adventure and creative spirit. Full of energy, hiberknitting is all about trying something new and planning ahead. No winter blues for you! Elegant and classy, you love sultry shades of red and rich textures that show off your exquisite taste. You’re always on the look out for inspiration, whether on a woodland walk or trip to museum of gallery. You love your creature comforts! Hiberknitting is the perfect time to stock up on your stash and take a rest after the hype of Christmas. This is snooze season, a time to restore before the bustle of spring – unless that is your not rustling up a super cozy bulky sweater in your favorite shade. 24 Responses to Take This Quiz & Find Out Which Hiberknitting Animal You Are! Great fun! So I’m a frog. I really do love these hoppy little creatures – how did you guess??? I was a dormouse but seem to have more in common with the Ladybird description. I’m the hedgehog, quite fittingly. I’m a skunk, always loved flower the skunk in Bambi. Like your favorite spot for knitting, in the family room in a comfy chair with family doing their own thing? munching on cookies and stuff, snuggled in a previously made blanket working on the current project. Enjoyed this. I’m a bear! It’s summer here but can be as limiting as winter when temperatures are extreme. I hide in the airconditioning, only going out for necessities like feeding and watering the hens and the dog, watering the plants in the early morning or evening if it’s been too hot. Then I can catch up on my rows, creating some satisfactory progress in colour and yarn. I’m an elegant and classy ladybird , how flattering ! Feel far from it , lounging around in my sweatpants and comfy sweater these snowy days . But I’m content and happy clicking away on my latest project . I’m a hedgehog. Very fitting too because I feed them. Lady bug for me. Cute Quiz!